Munson Healthcare’s Home Health Program offers seven different services to patients in 24 different counties. From hospice to home medical equipment to transportation, they reach out to people where they live. Telehealth is not new to the program, but the technology has vastly improved over the last decade. Michelle Dunaway introduces us to a patient who feels participation has brought him piece of mind. Robert Nicholls has heart problems and diabetes. “A number of different Munson doctors that help me manage my health across the board,” said Robert. But getting to a number of different appointments isn’t easy for him. “It’s extremely difficult for me to get out and it’s extremely difficult for me, because of the medical conditions that I have, to sit in a waiting room for a long time,” explained Robert. But for the last few months, he’s had another way to make sure he stays well: remote patient monitoring through the Home Health Program. While he still gets nurse visits two times a week, Robert is monitored every single day he checks his vitals. 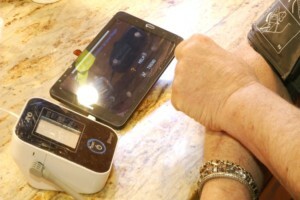 “It comes with a weight scale, a BP cuff and a device to check their oxygen level. So every day they sign in with a simple password, they check their vitals, it’s all Bluetooth and it gets transmitted. So we here at Munson Home Health, the care team can actually look at how is this patient doing. Is their weight up? Is their blood pressure up? What is happening with this patient?” explained Anne Bodnar with Munson Home Health. The program is not new, but the more advanced technology is. The 8-inch tablet gives patients a lot more flexibility and freedom when it comes to their care. “It’s a quick touch to the screen and we can do a virtual call. So then we get the alarm and, oh, Mrs. Smith would like a call. We would like to see the physician. So the tablet is small enough that they can to go any part of their body, so this wound or this is a situation I’m concerned about, and we can have eyes on the situation right then and there. So it works out really wonderful, it does keep the patient home,” explained Anne. The unit also offers patients educational videos to help supplement their care. The whole system has provided a welcome change for Robert. “It’s given me all sorts of encouragement about monitoring my health and making those steps forward and making myself feel better with the help of Munson,” said Robert. The service is free, but there are only a certain number of monitors available. A doctor has to feel like the patient is a candidate who needs the service.